My linear glass panel series is composed of colorful strips of sheet glass, cut and laid out in a design, then fused in the kiln to connect the pieces and soften the glass edges with the heat. The panels add color and texture to a space and allow for the play of light with the ridged glass surface. Customization is welcome. Color, size, shape, and display methods can be customized to fit a particular space. 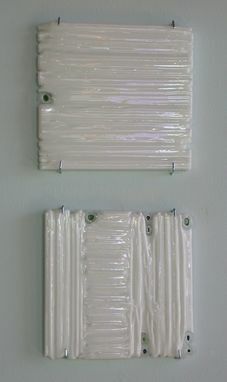 The panels can be displayed as wall pieces, tile work, cabinetry inserts, or lighting components. Pricing varies with custom choices. 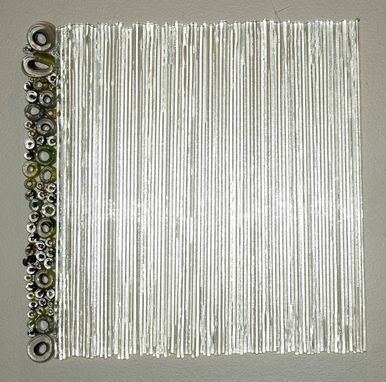 The green panel measures 20"h x 5"w x 0.5"d and is priced at $575.